Two more beautiful drawings, Debra! Love this drawing. 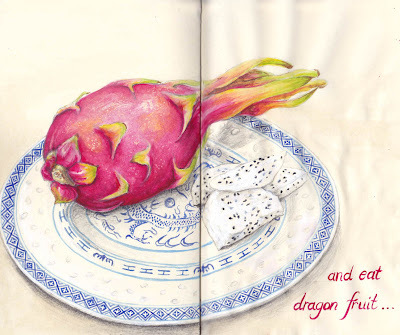 What does a dragon fruit taste like? And I didn't get to comment on your dragon yesterday. It was fabulous. I just love your sketchbook!! I've been offline for a while and I've missed some great postings here! This topic was made for you! Mmmm! Dragon fruit tastes great, everybody...a little like a kiwi crossed with Lychee, or something like that:) Such a lovely painting, beautiful colors. You're brave to put color on this wimpy paper...I've been chicken so far, but maybe I'll try. But maybe that's a reason I've been "moving along so fast". Thanks for looking at my stuff. Yours is beautiful! Anais, I don't think I discovered dragonfruit until I moved to Asia....it comes from a cactus like plant. Tahirih, great description of the taste of dragonfruit,I was at a bit of a loss to describe its very subtle, clean flavour ...I also think the skin would make a great dye but wouldn't know where to start.